Tuesday, June 5 from 6:30 p.m. until 8:30 p.m. 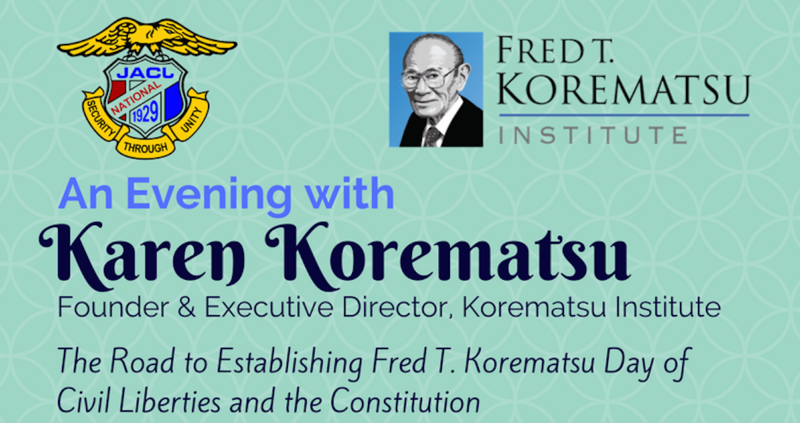 The New York chapter of the Japanese American Citizens League (JACL-NY) and the Korematsu Institute are co-sponsoring an evening to celebrate the recent establishment of an annual Fred T. Korematsu Day of Civil Liberties and the Constitution in New York City. Karen Korematsu is the dynamic and outspoken daughter of Japanese American civil rights activist Fred T. Korematsu, who, at the age of 23, refused to go to the U.S. government’s incarceration camps for Japanese Americans during WWII and took his case to the Supreme Court. Karen is also the Founder and Executive Director of the Korematsu Institute, a non-profit organization focused on educational efforts to address civil rights injustices and promote equal rights for all individuals regardless of race, gender, or nationality. Karen will discuss her father’s legacy and tell the story of how the Fred T. Korematsu Day of Civil Liberties and the Constitution was established in several states across the country. We will learn about the effort to have the day recognized in New York City, a two-year process that was officially observed on January 31 of this year. Space is limited, so please RSVP by contacting George Hirose at george.hirose@gmail.com. Please include “Korematsu Evening” in the subject line. JACL-NY and the Korematsu Institute are both important organizations that strongly address current day civil rights and moral issues by spreading awareness through events, political action, and effective educational programming. JACL-NY has spent the past year supporting and collaborating with our sister organizations to defend the rights of Muslims, immigrants, LGBTQ, and all other marginalized communities.